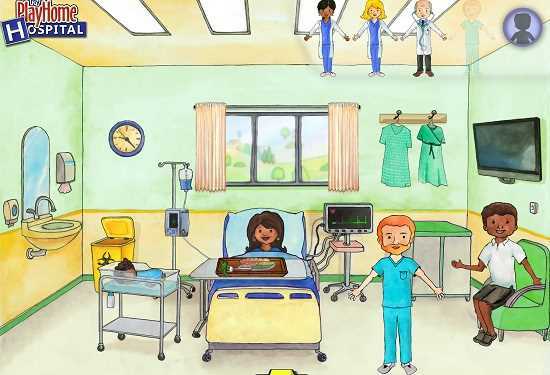 This interactive hospital setting encourages creativity and imagination while also helping to make doctors and hospitals seem less intimidating to kids. My PlayHome Hospital is a digital "doll house" set in a hospital. 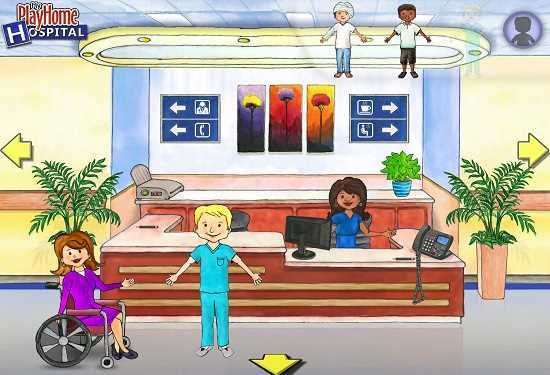 Kids place characters representing doctors, nurses, support staff, patients, and visitors into scenes to recreate typical hospital situations. The two-story hospital has a lot for kids to explore: there's an examination room, reception area, X-Ray room, nurse's station, waiting room, a gift shop, hallways with chairs and vending machines, and several patient recovery rooms including a maternity room – plus the hospital exterior, with a road that can expand the world by connecting to other purchased My PlayHome apps such as My PlayHome School. There are no instructions in My PlayHome Hospital. Kids discover new things by placing characters into the scenes and tapping the interactive objects in the room to see what happens. There's no way to "lose" or "win." Kids are free to explore at their own pace, and characters and items stay where they are until kids choose to "tidy up" the hospital and reset them to their original places. Players can dress characters in different outfits; situate them in chairs, wheelchairs, or in beds; and place objects like food, magazines, and tools in their hands. This creates limitless opportunities for role-playing. Kids can prepare a plate of food in the kitchen and take it to a patient, place a stethoscope onto a patient's chest to actually hear the heartbeat, administer medicine and apply bandages, take X-rays by scanning a patient's body, and even go for a ride in an ambulance. 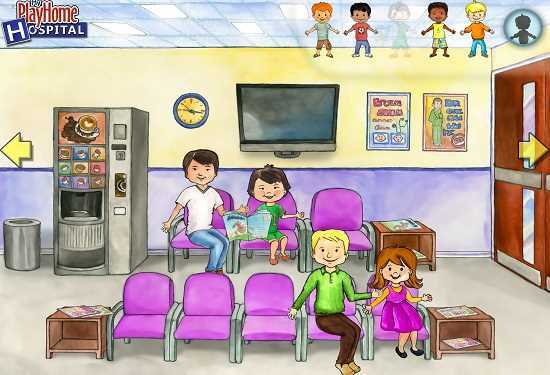 My PlayHome Hospital encourages kids to use their imaginations and develop empathy by helping to take care of others. The setting depicts a sanitized hospital setting with no blood, disturbing imagery, or hurt-looking people –- beyond those with bandages on their limbs or heads. Even the characters lying in the beds have pleasant expressions on their faces. The cast of 31 characters is inclusive and diverse. Males and females are equally represented in the occupational roles, along with generic males, females, boys, girls, toddlers, and a baby. 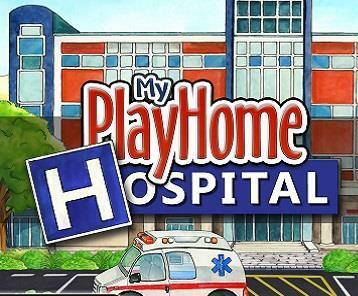 My PlayHome Hospital is part of a connected digital playset of related apps in the My PlayHome series. If players walk along the street outside the hospital, they'll see small logos for other apps in the spots where they would be available to play if they have been purchased. If you own the other apps, it is exciting to simply walk into one of the other playsets! This is an amazing programming feat. There's a small ad on the title screen for other apps by this developer. None of these are linked to the app store, however, so there's no way to purchase anything from within the app itself. And parents, you can turn off the ad by going to the Settings app for your device and scrolling down to find the options under My PlayHome Hospital. My PlayHome Hospital has broad appeal for kids of both genders. 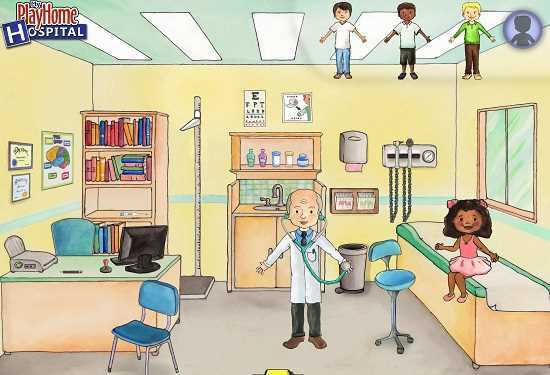 For kids who are anxious about going to the doctor, this is a great app for helping them to feel more comfortable in a hospital or examination room. By letting them be the ones who use the tools and equipment, the medical setting is less intimidating. 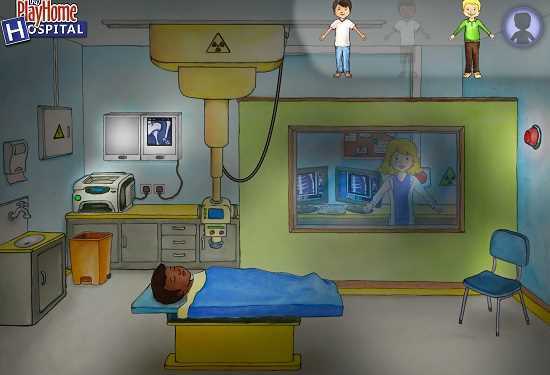 The imaginative play provided in My PlayHome Hospital allows children to work through potentially upsetting situations, such as getting a needle or X-ray, or having an oxygen mask put over their face. This kids' app review of My PlayHome Hospital was written by Erin Bell.